Welcome to the January Stamp of the Month Blog Hop! 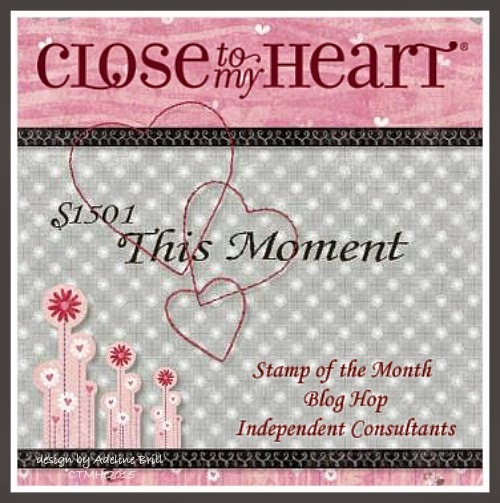 This month over 60 CTMH consultants are featuring the fun Valentine's Themed "This Moment" stamp set. If you have come here from Haley's Blog you are on the right track! If you get lost along the way, the complete listing of all participating blogs is found by clicking here. I used our new Heartstrings paper as my inspiration and pulled the Lagoon, Hollyhock and Whisper colors for some random stamping fun with the three different arrows. This card is for hand delivery so I layered on pop dotting to give my black arrow and target lots of dimension. Love the bit of bling some gold glitter paper adds! I used our Chevron punch to make some extra shiny embellishments and a wee bow from our Striped Whisper Ribbon to accent my arrow. I embellished the inside with more of the lovely Heartstrings paper and our Gold Shimmer Trim. The fun arrows are from the Zip Strip on our paper. Now hop on over to Jen's Blog to see what she has created! Thanks for stopping by today! Cute card - love how you have embellished the inside. Wow, this card has a huge impact! I love the bold and bright look. This is a really cute card....love the arrows in the different colors and directions.....really makes a statement. Super fun and the inside is great! Awesome card - too pretty to give away! Great card Paige! Love the inside, so pretty! Fabulous card! I really love the surprise inside and all the extra details. Beautiful card inside and out! Fabulous details!